Join CALS and AETN for the Arkansas premiere of a one-hour documentary by Brent and Craig Renaud that captures the personal stories of seven diverse artists who are redefining the American aesthetic. The screening is tonight (April 13) at 8pm at the CALS Ron Robinson Theater. These artists were a part of “State of the Art: Discovering American Art Now”, a groundbreaking exhibition at Crystal Bridges Museum of American Art in Bentonville. To create this exhibition, the curatorial team crisscrossed the nation to find extraordinary contemporary art happening in unexpected places. Be one of the first to experience this powerful story of artists working across our country, including here in Arkansas, prior to its debut on PBS nationally on April 26. This event is FREE and open to the public. Doors open at 7:00pm with general admission seating on a first come, first served basis. Presented by The Galleries at Library Square and AETN/PBS. Tonight (March 20) at 7pm at the Ron Robinson Theater. Celebrate the life, legacy and love of Sister Rosetta Tharpe. Learn about the woman who Cleveland County native Johnny Cash called his favorite singer. 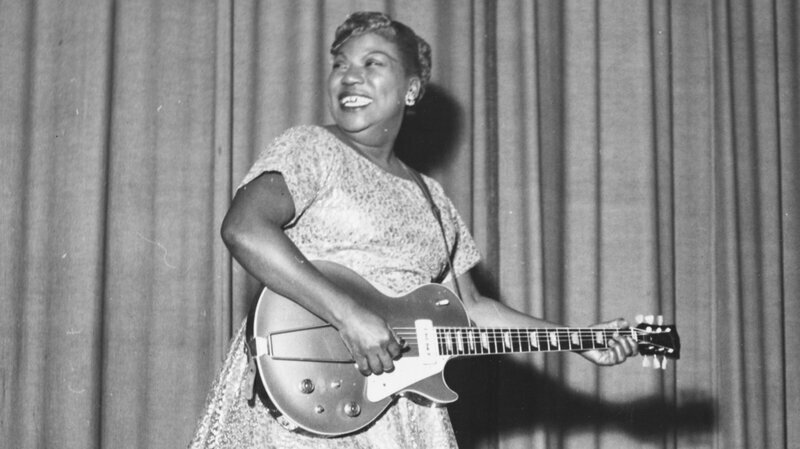 The director’s cut of the American Masters documentary profiles the newly inducted Rock & Roll Hall of Fame member Sister Rosetta Tharpe, paying tribute to the Arkansas musical legend on what would be her 104th birthday. This longer version features more performance footage and a special introduction by filmmaker Mick Csaky. Presented by Arkansas Sounds and AETN/PBS. Join the Ron Robinson Theater for a FREE public screening of AETN’s newest documentary, History on the Line: Preserving County Courthouses! Doors open at 2:00 p.m. The movie starts at 3:00 p.m. Historic county courthouses stand as iconic symbols of Arkansas’s development as a state, elegant testaments to justice and important sentries to the history of the state. History on the Line: Preserving County Courthouses introduces unsung preservationists and architects who travel the state finding ways to rehabilitate a building or, at the very least, fix a leaky roof to save the precious records inside. Also featured are county judges who deal with the financial burden of the historic buildings’ maintenance needs. The film visits the pristine, stately and recently restored Desha County courthouse in Arkansas City, shares stories from the record room in Madison County, and follows Mississippi County’s political and legal struggle over the viability of maintaining their split judicial district and their two historic county courthouses in Blytheville and Osceola. The documentary follows their struggles while telling stories of preservation and the importance of the historic county courthouses of Arkansas. Counties featured in the film include Desha County, Madison County, Calhoun County, and Mississippi County. The screening is sponsored by AETN and the Arkansas Humanities Council. Distinctly referred to as “a redwood tree, with deep roots in American culture,” Dr. Maya Angelou (April 4, 1928-May 28, 2014) led a prolific life. As a singer, dancer, activist, poet and writer, she inspired generations with lyrical modern African-American thought that pushed boundaries. Best known for her autobiography “I Know Why the Caged Bird Sings” (Random House), she gave people the freedom to think about their history in a way they never had before. With unprecedented access, filmmakers Bob Hercules and Rita Coburn Whack trace Dr. Angelou’s incredible journey, shedding light on the untold aspects of her life through never-before-seen footage, rare archival photographs and videos and her own words. From her upbringing in the Depression-era South and her early performing career to her work with Malcolm X in Ghana and her many writing successes, including her inaugural poem for President Bill Clinton, “American Masters” – “Maya Angelou: And Still I Rise” reveals hidden facets of her life during some of America’s most defining moments. This film is presented in partnership with Arkansas Educational Television Network. Arthur Lee (Art) Porter Sr. was a pianist, composer, conductor, and music teacher. His musical interest spanned from jazz to classical and spirituals. One of the new event spaces in the Robinson Conference Center is named in his memory. Born on February 8, 1934 in Little Rock, he began his music education at home. He played in church at age eight; played his first recital at twelve; and, by fourteen, hosted a half-hour classical music radio program on KLRA-AM. He earned a bachelor’s degree in music from Arkansas AM&N College (now UAPB) in May 1954. The next year, he married Thelma Pauline Minton. Following his marriage, he pursued graduate study at the University of Illinois, University of Texas and Henderson State University.